When I saw this recipe on The Sister’s Cafe, I knew I had to try it. It was so delicious. I loved it, loved it. The cake was moist (thanks to the same method as the Perfect Lemon Cake and the Super Moist Fudge Bundt Cake) and lightly flavored with citrus. The butter glaze, while decadent, is essential in my book. I mean, you are eating cake, why not glaze it with butter and sugar right? The glaze soaks into the cake giving it a delicious, light (but not light, if you know what I mean) buttery texture and taste. This is a perfect summery dessert and would also be great for a ladies luncheon or baby or bridal shower. I dusted the top of my cake lightly with powdered sugar to give it a little oomph in the way of looks. For the cake, mix yellow cake mix, vanilla pudding and poppyseeds. Add juice, oil, and sour cream and mix. Add 4 eggs one at a time, mix well. Grease and flour a bundt pan. Bake at 350 degrees for 40-45 minutes (don’t overbake). When the cake is about 10 minutes from being done start the glaze. For the glaze, bring ingredients to a boil and keep bubbling until ready to pour over cake. You can either pour the glaze over the cake while it is in the pan or turn the cake out onto a cooling rack and pour the glaze over the cake that way. It is really like syrup that soaks in. (Some commenters have said that glazing the cake in the pan makes it hard to remove because the glaze gets sticky. I glazed it out of the pan and it worked great.) Give it a few minutes to soak in and then turn it out onto a cake plate. Optional: dust top of cake with powdered sugar. This cake is fantastic! Super moist, and tastes like a glazed donut. I think I’ll add a little more poppyseed next time. Definitely going into my recipe box. 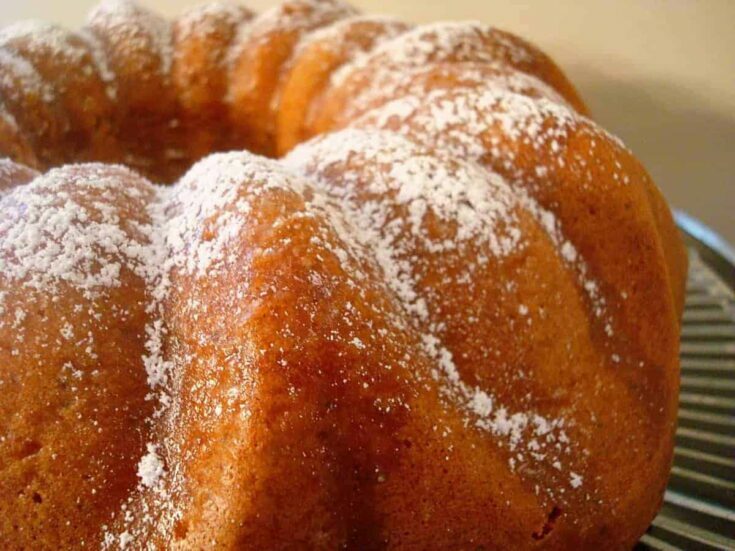 A sure, no-miss method to removing cakes from Bundt pans (learned from America’s Test Kitchen): melt a couple teaspoons of butter and, using a pastry brush, paint the interior of the Bundt pan, making sure to get all nooks and crannies. then lightly dust with flour. works every single time. I made this with lemon juice (and threw in the zest from one lemon into the cake mix). It turned out great. I have been making this very cake for over 10 years now! Even the instructions are the same! It really is so extraordinary and a favorite– people ask for the recipe every-time. I like to pour the glaze over the cake while it is still in the bundt and then let it cool completely before turning it over. Maybe that helps with the stickiness issue?? I’m looking for the moist chocolate bundt recipe that used to be here but I don’t see it….that was another great one. Bunny – poppyseeds are more texture than taste, in my opinion. If anything they have a flat, crunchy taste – definitely not sweet but they compliment desserts like this really well. This looks wonderful!! I’ve never put poppy seeds in anything, do they have a taste to them ??? This was definitely one of my favorite cakes EVER!! It was so light and fluffy and totally delish! I totally recommended this one!! wow- made this today for a visiting teaching luncheon and everyone (including myself) was dying over it! my hsband got a little too and said it was the best cake he’s ever had. thank you for all your yummy recipes- I tell all my friends about your blog- it’s my favorite. i love, love, love it. now that’s what i call a moist cake! it doesn’t even look like it needs a glaze, but who am i kidding…a glaze never hurt anything. 🙂 lovely. I am glad you like this recipe! It is a favorite at our house. My boys get really excited when I make it. The glaze does make it, I agree! And the powdered sugar is a pretty touch! I had to laugh at the comment above–I think we do confuse people!! ooooh that looks SO good. I love poppyseed anything. Camille – thanks for weighing in on the glaze question. I actually glazed it out of the pan when I made it by I reread the directions and it seemed like it should have been glazed in the pan so I edited the recipe that way. I think I’ll go back and clarify both options. I’m glad you liked it, though! This is my new favorite cake as well! I do have to tell you though that putting the glaze on while it was still in the pan didn’t work out so well for me. It was hard to get the cake out of the pan when it got sticky. I now take it out and glaze (even though it’s messy)! I guess it’s just preference. rebabell – wow, what a sweet comment! It was fun to read and I really appreciate your kind words. I’m glad you (and the ladies and the husband) liked the cake. It is a great one for a VT luncheon – great idea! 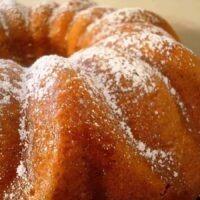 Beautiful bundt cake – they always make me think of my paternal grandmother (who would cringe if she saw the word grandmother associated with her name 🙂 ) — she always has some kind of bundt cake on hand to go perfectly with her signature hazelnut coffee! I just made this and it is divine! I doubled the poppy seeds (not sure why- thought I read that somewhere). After pouring the glaze over the cake on the cooling rack, a lot of it just went under the cooling rack (I had a cookie sheet to catch any drips). The cake was still plenty sweet and has a nice crisp thin outer layer. It is so addictive! Thanks Melanie! Jen in CA – I think it is definitely worth a try to use lemon juice. I don’t think it would be too tart and I agree that the combo of lemon an dpoppyseed together would be great. Let me know if you try it! Mmmm, mmmm, mmmm!!! This is my kind of cake. Can’t wait to try it! Anonymous – ok, I deleted my previous comment because I think I made the cake wrong. After reading the instructions, I amended the recipe to pour the glaze over the cake while still in the pan. I did it after taking the cake out of the pan but realize that was messy and it would be easier to pour it over while the cake is in pan. Abby – I actually realized you were confused based on another comment you left and meant to comment back and clear it up but forgot. It does make for a good laugh! I am so excited to try this one! I can imagine the glaze and poppy seeds melting in my mouth! You have inspired a craving that must be met and I appreciate your post! Stacie – I agree, the glazing can be kind of messy. But I’m glad you liked this! Thanks for letting me know. And it sounds as if doubling the poppy seeds is not a bad thing. I’m wondering if this can be made with lemon juice and not be too tart? 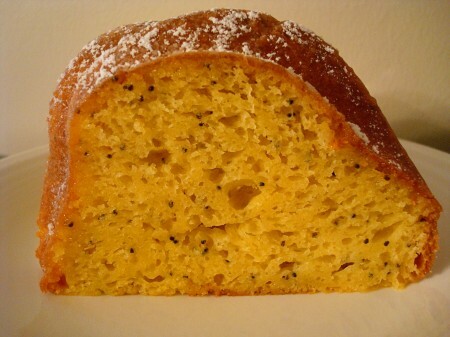 My hubby loves lemon and poppyseed together! So do you pour the glaze on while it is still in the bundt pan?